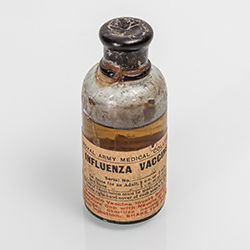 One of the most striking items in the Florence Nightingale Museum’s exhibition on the 1918 Spanish flu pandemic is a small bottle containing a prototype vaccine. Produced in 1919 by the Royal Army Medical College using lung scrapings infected with Spanish flu, the vaccine demonstrates the desperate efforts to protect people from the deadly disease. It is also a reminder of how far we have come in the past century. by the Royal Army Medical College. 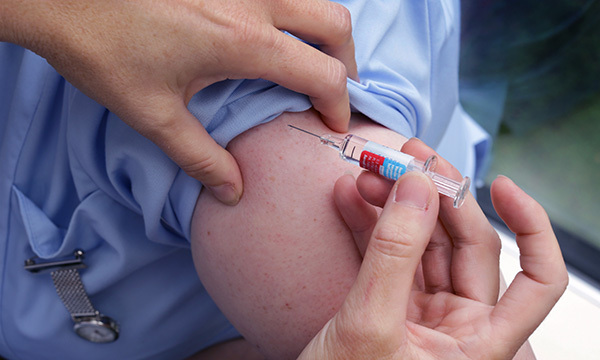 As the UK enters the 2018 flu season, GP practices and other healthcare organisations are getting into the stride of this year’s vaccination programme. By looking back at how things were during the pandemic of 100 years ago, the exhibition prompts visitors to consider what lessons it holds for today. In particular, public health nursing leaders hope it will encourage people, including nurses, to take up the opportunity to be vaccinated – and to appreciate the important new roles that nurses are playing in tackling flu. 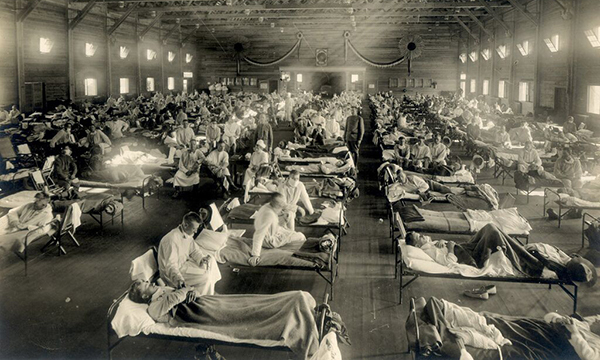 The Spanish flu pandemic took hold towards the end of the first world war, and its spread was exacerbated by the large numbers of troops moving as hostilities ceased. Some half a billion people were infected worldwide and up to 100 million died, including 250,000 in the UK. Unlike in most seasonal flu outbreaks, young and healthy adults were particularly at risk. The terrible symptoms included severe nosebleeds, delirium and heliotrope cyanosis, a condition in which a dark blue or purple flush spreads across the patient’s body. With no antibiotics available to combat secondary infections such as pneumonia, many patients effectively died from drowning as their lungs filling with fluid. 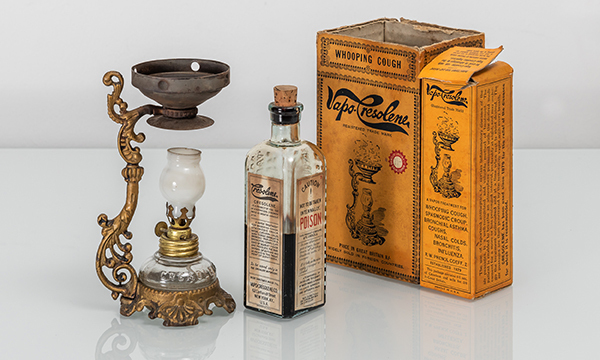 ‘Nursing was key to treating flu 100 years ago, as it is today,’ says Ms Carter-Chappell. ‘In 1919 there were no vaccines, antivirals or antibiotics. All that could be done was to practise good hygiene and keep the patient comfortable, giving them fluid and nutrition. Nursing played a crucial role. RELATED: Flu vaccinations: should they become mandatory for NHS staff? ‘Of course, many nurses contracted the virus from patients – it was a bigger killer of military nurses than the war. Nursing during the pandemic drew on the work of Florence Nightingale in the Crimean War, she says, work that remains relevant today. ‘She introduced hygiene and infection control, which was vital to preventing disease. That hasn’t changed. Public Health England deputy chief nurse Joanne Bosanquet says the exhibition is a timely reminder that flu is still a serious threat. In many ways we are in a better place than we were 100 years ago, she says. For example, the growth in worldwide travel has been matched by development of worldwide surveillance, including the World Health Organization’s global pandemic plan. ‘We have much more sophisticated surveillance than we had even in 2009,’ says Ms Bosanquet. ‘It enables real-time communication, and social media has been phenomenal in this too. RELATED: Are efforts to increase flu vaccination rates among front-line nurses excessive and impractical? Improvements in immunology, allowing strains of flu to be tested early on and suitable vaccines to be developed, have been crucial, as has the use of antibiotics and antivirals, Ms Bosanquet says. But she stresses that wider understanding of how the virus spreads has also been hugely important. ‘A hundred years ago they didn’t understand how flu was transmitted and they didn’t understand the need for protection.’ Today, each country in the UK has its pandemic flu plan, and they are tested regularly. ‘We’re as ready as we can be,’ she says. But she also stresses the importance of protecting against seasonal flu, including taking up the opportunity of vaccination. That goes for nurses too. ‘My view is that as responsible healthcare professionals we should be protecting ourselves and protecting the people we care for,’ she says. Guy’s and St Thomas’ NHS Foundation Trust deputy head of nursing infection prevention and control Shona Perkins agrees. ‘I’m an infection control nurse so I’m biased – I believe staff should be vaccinated,’ she says. Eight out of ten staff at Guy’s and St Thomas’ were vaccinated last year as a result of co-ordinated action led by occupational health teams and backed by enthusiastic peer vaccinators. They hope to do even better this year, Ms Perkins says, with similar efforts taking place in NHS organisations across the country. Ms Perkins believes it is vital that people take flu seriously – after all, even with modern healthcare, infection can be fatal. But it is also important to get across the message on how to minimise the impact of the virus. Her favourite part of the exhibition is a visual ‘aerosol’ effect that demonstrates how flu spreads from person to person via coughing and sneezing. ‘It’s all kinds of gross,’ she says. ‘But it’s a good visual reminder of how we transmit flu.